1. Preheat oven to 325°F. Grease 2, 24 count mini mun pans*. 2. Place the sugar, our, graham crumbs, and salt in food processor. Pulse to combine. Add butter pieces, pulse to ne crumbs. 3. Put 1 tablespoon of crust mix into each cavity of mini mun tin and press in, forming a small cup. 4. Bake until edges begin to brown, about 12 minutes. 5. Once cooled, invert pan and tap to remove cups. If desired, save the crumbs and use them as a garnish for the tops. 1. In the bowl of an electric mixer, sprinkle the gelatin over the 1/3 cup water. Let sit to bloom. 2. In a small saucepan, place the ¼ cup water. Carefully pour sugar into pot, keeping it away from the sides of the pan. 3. Cook over medium heat until sugar is dissolved. Only stir if necessary to incorporate sugar into water. Use a pastry brush dipped in water to clean any sugar crystals from the side of the bowl. 4. Once sugar is dissolved, turn heat to medium-high. Do not stir at this point, and only use pastry brush if absolutely necessary. Put candy thermometer into pot. 5. Boil sugar until it reaches 238°F (soft ball stage). 6. Remove from heat. With the mixer running on low, carefully stream sugar mixture into the gelatin mixture. Go slowly at rst to avoid formation of gelatin lumps. 7. Once sugar is fully incorporated, turn mixer up to medium high. Beat until fluffy, stiff, and cool. Transfer mixture to a large piping bag. 1. Pipe marshmallow on to baked, cooled shortbread. 2. While the marshmallow is setting, temper milk chocolate or melt with coconut oil. 3. Once marshmallow is set, dip the tops in to the chocolate coating. 4. 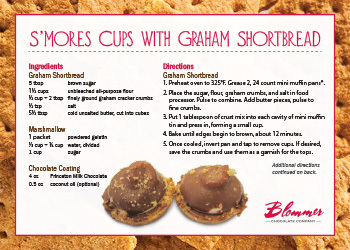 Sprinkle with crust or additional graham cracker crumbs if desired. Let set before serving. If using coconut oil, store in refrigerator for a rm coating. Bake the shortbread in a 9x9 square pan lined with parchment paper and well-greased. Spread the marshmallow on top of the cooled shortbread, and once set, spread the chocolate topping. 1. Whisk the egg yolks with the sugar in a medium bowl. 2. Bring the milk to a simmer over medium heat in a medium saucepan. 3. Once it reaches a simmer, remove the milk from the heat and carefully stream half the milk into the egg yolks, whisking constantly. Return the pan to the heat and transfer the yolk mixture into the pan with the remaining milk, whisking constantly. 4. Switch to a wooden spoon and cook the custard, stirring constantly, until it thickens enough to coat the back of the spoon such that when you run your nger through it, it leaves a clear line. Do not let it boil; it will curdle. 5. Once thickened, remove immediately from the heat and transfer to another container to cool (pour through a strainer if your sauce has any lumps). Place in the refrigerator to cool. 1. Place the egg whites with a pinch each of salt and cream of tartar in the bowl of a standing mixer. Whip on medium until foamy. 2. While continuing to mix, slowly add the sugar in a ne stream. Whip until glossy, medium peaks are formed. 3. While whipping the meringue, bring a saucepan of water to just below a simmer on the stovetop. ed and firmed (30 seconds for mini, 1-2 minutes for larger meringues). 1. Finely chop the chocolate and place it in a small heatproof bowl. 2. Bring the cream to a rapid boil. Pour over chocolate. 3. Let sit to melt the chocolate, then carefully stir to emulsify. 4. Set aside to cool at room temperature. 1. Place a small pool of ganache in the center of the vessels. 2. Pour in custard to cover the bottom of the dish. 3. Place a meringue in the center and sprinkle with graham cracker crumbs. The crème anglaise and ganache be made up to 3 days ahead and stored in the refrigerator until ready to use. The ganache will need to be warmed up to a pourable consistency if coming straight from the refrigerator. Meringues should be made just before serving. 2. Grease 8x8 pan, line with parchment (bottom and two sides), and grease parchment. 3. Melt butter/shortening with vegetable oil in the microwave. 4. Whisk sugar with melted fat mixture. 5. Whisk in egg and yolk, being careful to fully emulsify without incorporating much air. 6. Sift dry ingredients over wet mix, carefully fold together until completely uniform. 7. Spread evenly into prepared pan. 8. Bake in preheated oven for 20 minutes or until edges are set. 9. Cool in pan. 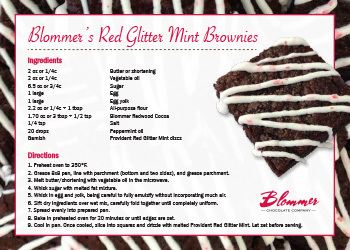 Once cooled, slice into squares and drizzle with melted Provident Red Glitter Mint. Let set before serving. 1. Lightly coat a 8x8 baking dish with nonstick spray. 2. Brown the butter in a saucepan over medium heat. Cook, whisking constantly, until the foam subsides and the solids turn brown and smell nutty, about 3-5 minutes. Remove from heat. Stir in cinnamon, salt, and marshmallows. 3. In a large bowl, combine browned butter mixture and crisped rice cereal and gently toss to combine. Stir in chopped white chocolate. 4. Spread the mixture into the prepared baking dish. 5. Make the glaze by melting the chocolate and cream together. If using a microwave, heat in 30 second intervals, stirring in between each interval so as not to overheat. 6. Spread the glaze evenly over the top. 7. Let cool at room temperature for at least 2 hours, or until the glaze is set, before cutting. 2. Butter and line 9x9 baking pan with parchment. 3. In a double boiler, melt the butter and white chocolate. Allow to cool to room temperature. 4. In a mixer fitted with a whisk attachment, whip eggs, sugar and vanilla until pale and beginning to thicken. Reduce speed to medium and add chocolate mixture. 5. 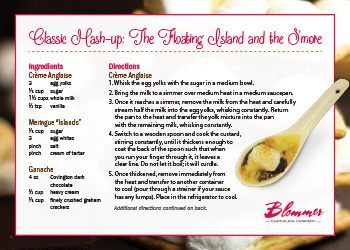 In a separate bowl, sift together flour, baking powder, and salt and stir into the egg mixture, by hand. Stir in the Ivory Drops. 6. Bake for approximately 30-35 minutes, or until they are golden brown on the surface and the center no longer jiggles when the pan is shook or a toothpick inserted comes out clean. transfer from the pan to a large bowl. Allow the butter to cool somewhat. 4. Whisk together the flour, soda, and salt in a small bowl. 5. Add the brown sugar to the warm browned butter and mix thoroughly with a whisk, careful not to incorporate air. 6. Whisk in the egg and yolk, making sure to fully emulsify. Add vanilla. 7. Carefully fold the dry ingredients into the wet in three additions. 8. 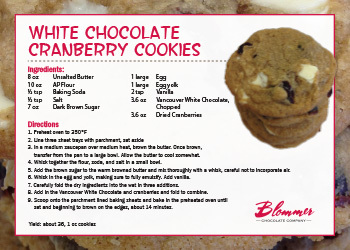 Add in the Vancouver White Chocolate and cranberries and fold to combine. set and beginning to brown on the edges, about 14 minutes. 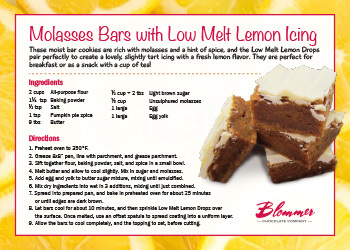 These moist bar cookies are rich with molasses and a hint of spice, and the Low Melt Lemon Drops pair perfectly to create a lovely, slightly tart icing with a fresh lemon flavor. They are perfect for breakfast or as a snack with a cup of tea! 2. Grease 8x8” pan, line with parchment, and grease parchment. 3. Sift together flour, baking powder, salt, and spice in a small bowl. 4. Melt butter and allow to cool slightly. Mix in sugar and molasses. 5. Add egg and yolk to butter sugar mixture, mixing until emulsified. 6. Mix dry ingredients into wet in 3 additions, mixing until just combined. 7. Spread into prepared pan, and bake in preheated oven for about 25 minutes or until edges are dark brown. 8. Let bars cool for about 10 minutes, and then sprinkle Low Melt Lemon Drops over the surface. Once melted, use an offset spatula to spread coating into a uniform layer. 9. 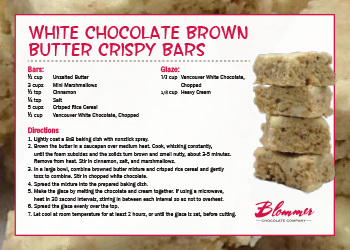 Allow the bars to cool completely, and the topping to set, before cutting. 2. Line three sheet trays with parchment, set aside. 3. In a medium saucepan over medium heat, brown the butter. Once brown, transfer from the pan to a large bowl. Allow the butter to cool somewhat. 6. Whisk in the egg and yolk, and vanilla, making sure to fully emulsify. 8. 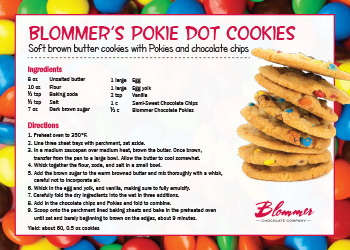 Add in the chocolate chips and Pokies and fold to combine. 9. Scoop onto the parchment lined baking sheets and bake in the preheated oven until set and barely beginning to brown on the edges, about 9 minutes. 1. Prepare a pan by lining with parchment and coating thoroughly with cooking spray. Place an 8x8 pan on a heat proof surface where it can remain overnight without being disturbed. 2. Combine the cream and sugar in a medium saucepan and bring to a boil over medium heat, stirring constantly. 3. Slowly add the corn syrup. Once the corn syrup is incorporated, clip on a candy thermometer. Continue to cook over medium heat, stirring constantly, until it reaches 230°F. 4. Add the butter and salt, and continue to cook until 234°F, add roasted carrot and cinnamon, then continue to cook until 243°F. 5. Pour the mixture into the prepared pan. Leave overnight to set. 6. Once set, remove caramel from pan, peel off parchment paper, and cut with a sharp knife into 1” cubes. Dip in tempered Hancock Milk chocolate. 2. Preheat oven to 350°F. Grease 8x8 pan & line with parchment, or line 2 mini-muffin tins with liners. 4. Whisk eggs with sugar until smooth. Whisk in warm chocolate mixture. 5. Sift dry ingredients over wet, fold in until just combined. 1. Chop mint leaves and Vancouver White Chocolate and place both in medium sized bowl, set aside. 2. Heat 100g of heavy cream to a boil. 3. Pour heavy cream over mint and Vancouver White Chocolate. Let sit for 1-2 minutes to melt, then whisk to emulsify. Allow to cool slightly before applying to brownies. 1. Add the honey to the cream and bring to a boil, add the flavoring. 2. Pour the hot cream mixture over the chocolate. Allow to sit for 1 minute to melt the chocolate, then stir carefully from the center to form an emulsion. 3. Massage the butter into the ganache, taking care that no lumps of butter remain. 4. Cool to a pipeable consistency and transfer to a piping bag. 5. Pipe small mounds on a parchment lined sheet and allow to crystallize overnight. 6. Dip in tempered Princeton. 1. In large bowl, cream butter and sugar with zest and thyme until just combined. 2. Sift together flour and salt and add to butter mixture. Mix until dough just comes together. Remove dough from bowl, wrap in plastic wrap, and chill. 4. Roll out dough ¼” thick, and cut into 1" rounds. 6. Bake at 350°F until edges are just beginning to brown, about 15-17 minutes. 1. In a bowl from a standing mixer, sprinkle gelatin over half the tea to bloom. Attach the bowl and whip attachment to the mixer. 2. Prepare a piping bag with a star tip or an 8x8 pan with parchment and cooking spray. For piping, line two sheet trays with parchment paper and spray lightly with cooking spray. For 8x8 pan, sprinkle a fine layer of corn starch mixture over the bottom and sides of the pan. Tap out excess and reserve for sprinkling on top of the marshmallows. 3. Place the sugar and corn syrup in a medium saucepan with remaining tea. Place over medium heat, stirring until mixture is uniform. Once sugar is dissolved, add lemon juice and clip in a candy thermometer and increase heat to medium high. Cook without stirring, until mixture reaches 238°F (softball stage). 4. Start the mixer on low. Slowly stream the hot sugar into the gelatin. Once all the sugar is added increase the mixing speed to high. Whip until light pink and fluffy and the bowl is just warm to the touch. 5. Working quickly, transfer to piping bag and pipe 1" stars, or spread evenly in the prepared pan. 6. Dust the top with the remaining cornstarch/sugar mix and leave at room temperature overnight to set. 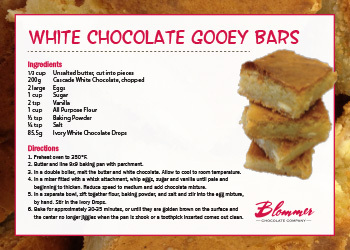 For 8x8 pan, once set transfer marshmallow to a cutting board and slice into 1 1/2 cubes. Dust the cut sides with cornstarch/sugar mix.